Ben Smith is BuzzFeed’s editor-in-chief. Since joining the company in January 2012, Ben has built a newsroom of over 300 reporters and editors, led expansion of over 20 content verticals, and built teams across the world. 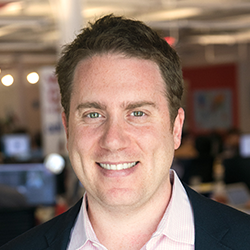 Under his leadership, BuzzFeed’s coverage has grown to include politics, business, investigative reporting, longform journalism, and entertainment while growing the site’s traffic to over 200M monthly unique visitors. Ben was called “one of the most talented and admired scoop-mongers in the game” by The New Republic, named one of Fast Company’s “Most Creative People in Business,” and featured as Fortune’s “40 Under 40” for his work at BuzzFeed. Prior to BuzzFeed, Ben was senior political writer for Politico from 2007 to 2011. Before Politico, he wrote a column and a blog for the New York Daily News, started New York’s first political blog, The Politicker, for the New York Observer, as well as the political site, Room Eight, after working as City Hall Bureau Chief for the New York Sun and as a stringer for the Wall Street Journal in Latvia. Ben has written for publications including the Wall Street Journal, The Los Angeles Times, Slate, The New York Post, and The New Republic. He was born and raised in Manhattan, and now lives in Brooklyn with his wife and three children. Smith delivered a keynote speech at ISOJ 2018 (Saturday, April 14 @ 9:00 a.m.).